Queen Anne or second empire Victorian mansions have sooo much character in their architectural features; from grand staircases, stained glass, and turrets, to pocket doors. The woodwork in some is incredible (not to mention no longer found in today’s homes). 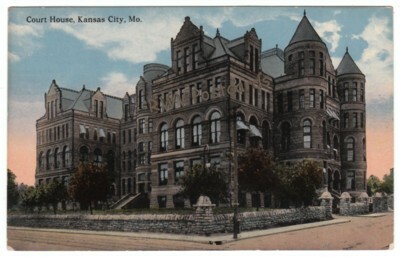 The above postcard of the second Kansas City, MO courthouse (razed in 1936) isn’t a Victorian mansion, but does have a lot of character too. Kansas City’s second courthouse had symmetrical and rounded windows, cresting, turrets, and was made of native stone. 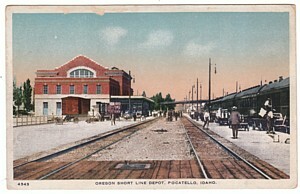 It was located at 5th and Oak Streets, and cost $200,000 in 1892. Some people were dissatisfied with it, and demanded a more attractive and accessible building. I don’t know why they found it unattractive. The aforementioned features were found in many Victorian homes of the times. Did they find their own homes unattractive? I also wonder why they considered it inaccessible. It can’t have been the location. The third courthouse was built just down the street. Maybe they considered the stairs a problem? I don’t know why as the stairs don’t look as steep as stairs in Victorian houses. We may never know the whole story regarding why people were dissatisfied with their courthouse. What we do know is the second courthouse was razed and salvaged after 43 years of use as part of Judge Harry S. Truman’s “10 Year Plan”, starting in 1930, to transform Jackson County and Kansas City’s skyline. Ephemera Trivia: President Harry S. Truman was elected judge of Jackson County, MO in 1926. He therefore worked in Kansas City’s second courthouse.